It was fun to present MDM to our colleagues associated with MaineQualityCounts. They are doing great work and this work clearly resonated with frontline folks. For example, nurses working in the Community Care Teams found it compelling to think of their work as promoting / defending patient capacity. You can review the presentation here and the video here. It is very clear that capacity that could be deployed to do meaning-making work (spend time with family, pursue interests, support loved ones, achieve goals) will compete favorably with patient capacity vs. work of being a patient that is disconnected from patient goals. In failing, the healthcare system will respond with more work or with disparaging comments about the patient or by firing the patient. This is going to come to a head as a wave of previously underserved people, many with chronic conditions and most with limited capacity for self-care, will encounter health care systems well-oiled to achieve disease-specific performance measures. The solution here is to implement minimally disruptive medicine. It is frustrating to me that we still do not know exactly how to do it, but research grants have been submitted and our team continues to explore best approaches. We need to do more, faster. Our patients deserve it. David Eton has led a team of researchers in summarizing existing tools to measure the burden of treatment. The paper was just published. 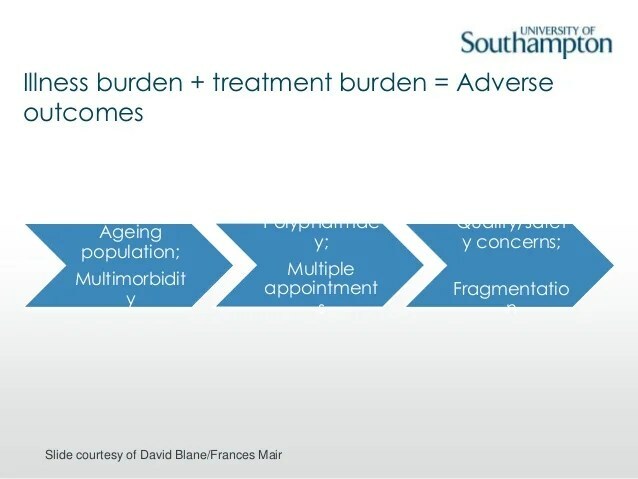 Measuring burden of treatment is one of the cornerstones of minimally disruptive medicine. Making patients and clinicians aware of the burden of treatment might be helpful in moderating the intensity of treatment to ensure it matches without overwhelming the existing capacity of the patient and caregivers. Let us know what you think of this important review. Minimally disruptive medicine – synonyms to inspire the road ahead. The last few weeks have seen a surge in discussions in the press about minimally disruptive medicine. The Wall Street Journal had a piece as did the Star Tribune in Minnesota here. This press in turn has led to a number of people to reflect about healthcare and to contact our research team to test the model out. Meanwhile two teams are working on measuring treatment burden, and two reviews are considering how the Cumulative Complexity Model can help understand the (in)efficacy of lifestyle modification interventions and readmission prevention interventions. Much to do everywhere to lift the burden off patients with multiple chronic conditions. – Goldilocks (not too much, not too little, just right) – it is not only about reducing healthcare, it is about optimizing the healthcare footprint making sure that under use of desirable interventions is addressed as well. – Wellness for the sick – emphasize function to increase capacity as part of the strategy to reduce treatment burden. – Lean consumption for patients – maximize the efficiency of the work of being a patient. What other parallels can we draw? What else could we learn about these disciplines? The quest to reduce the healthcare footprint on the lives of individuals and communities presses on. The response from the audience at the 2013 ICSI Colloquium in St Paul, MN was quite telling: clinicians wondering how to overcome the impotence they feel as they comply with guidelines, care processes, and public reporting that they feel makes them deviate from patient goals; patients echoing my call for patients to lead a revolution in healthcare. Indeed, a patient from Texas, who pertinently had the last word at that ICSI presentation, made an impassionate plea for change, for patient-centered care, for minimally disruptive medicine. She then proposed: Let Patients Lead. This moved me and reminded me of a friend’s friend who in reviewing the concept said that he felt this should be renamed Maximally Generous Medicine. Another synonym to inspire our journey.